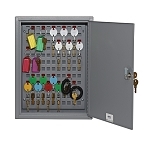 Slotted key cabinets have slotted key racks that store keys uniformly for easy identification. The advantage of Slotted key racks versus Hooks is capacity. 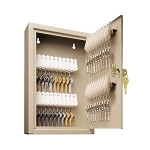 You can get a lot more keys into a slot style key cabinet. But you do loose some flexibility in that you have to use a slotted key tag instead of a key tag of your choice. 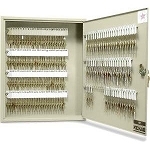 If you want to use your own key tags, please see our Hook Style Key Cabinets. And remember, we can replace the normal wafer lock on any key locking cabinet with a mechanical combination lock (with key override) or an electronic lock.